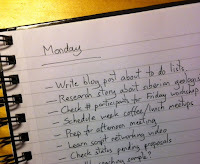 Every working week usually ends for me by writing a "to do" list for the work to be done the next week, or at least Monday. I do this partly so that I don't forget the work in progress, or the highest priorities, but it also has the useful side effect of making the weekend more relaxing. This offloading of the work still to be done onto paper or a file appears to lighten the load on your mind, since you know the list is safely written down and you don't need to keep thinking about it. How you do this mental offloading step doesn't seem to make any difference. At my own desk I tend to use a paper list and when I am travelling I often use an email to myself. Once the list is safely written you can mentally "close the office" for the weekend without being stressed by all the work still to be done. It has always worked for me, though I don't recall seeing any serious research to back it up.